I recently got an FM TOWNS II HR model for Christmas and I am currently seeking enough information required in order to use it properly. In the U.S., the number of volts in my house is 120 @ 60hz, while this FM TOWNS II HR model uses 100 @ 60hz. It's possible to plug it in the outlet, but after a while, it unexpectedly powered off. I'm sure it's okay right now after that happened. Currently, I am seeking a power converter and a Analog RGB to VGA/RCA Component for hooking up to my ION VCR 2 PC converter. I would also like to find the best affordable 3.5 inch floppy disks for use with the machine. Last edited by 1983parrothead on November 18th, 2017, 1:50 pm, edited 1 time in total. I don't think the shutdown depends from the excess 20V you are putting into your FM-TOWNS . I think your PSU ha some trouble or the system itself.Try to disconnect peripherals like HDD, CD-ROM and FDD. [/quCurrently, I am seeking a power converter and a Analog RGB to VGA/RCA Component for hooking up to my ION VCR 2 PC converter. I would also like to find the best affordable 3.5 inch floppy disks for use with the machine. How do I do that? By dissecting the FM Towns? It might have some bad capacitors, right? 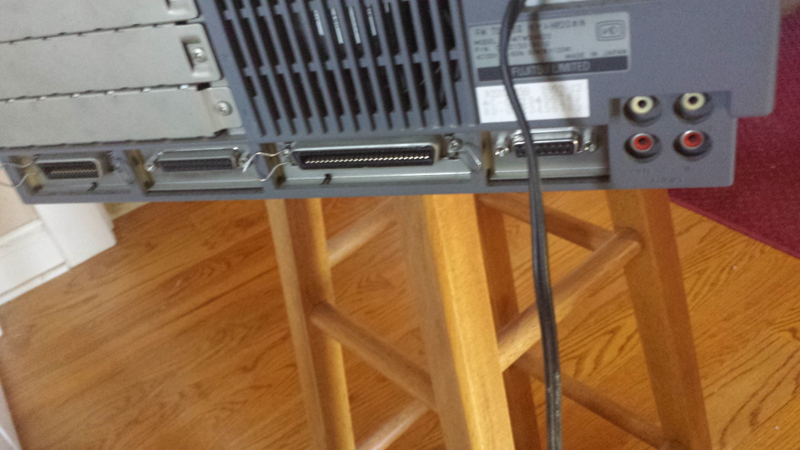 For the RGB to VGA converter, that one you showed me doesn't look like it will fit. The Analog RGB port is 15 pins in 2 rows. Try first a 120V to 100V step-down converter to be sure of this issue.If til will be confirmed you have to start your troubleshooting. No RGB--->VGA converter will have a D-SUB 15 pin connector as input which is the standard AV pinout for all the japanese machines (or better , maybe there are some specific japanese converters, have to check) so you have to build a custom adapter, I've done this for all my japanese computer since I use a Commodore Microvitec M1438S as monitor.FM-TOWNS AV output has both separate H-SYNC+ V-SYNC and C-SYNC so it could be fine with this. My goal is to record a playthrough of Asuka 120% BURNING Fest. 3-disk version straight from my FM Towns to my PC using an ION VCR 2 PC converter, but hooking it up to the VCR 2 PC converter requires an adapter. Of course, using a screen-capture app and UNZ is the best for quality, recording straight from the FM Towns is more accurate I guess. I not have found a way to record the game with real hardware in high quality as the emulator. Only s-video. Or use multiple devices simultaneously. But switched manually by changing the resolution in the game is very inconvenient. A very special video signal, at least on my FM-TOWNS Ⅱ CX20. Problematic games that I've played Shadow of the Beast 2, Asuka 120% BURNING Fest., Columns. Now the FM Towns won't power on anymore. What's going on? Perhaps blown fuse on the power supply. Open the case and look. What does the fuse look like? I sometimes hear a sizzling sound of some kind. Sounds like I need a power converter. If it's damaged, then should I trade mine for a working model? Finding someone with a working model and especially trading would be difficult. I just got a voltage converter and the home computer failed to stay on. I think some capacitors need to be replaced. I took it to a repair shop and they said it is best to find a working PSU by TDK CA02951-0620.